Summerville, SC – (March 30th, 2019) – Creative Colors International, the nation’s leading on-site repair and restoration franchise, will launch its newest location on March 19, in the Summerville, South Carolina area. This is big news, as more local business owners and cost-conscious residents than ever are seeking alternatives to astronomical upholstering charges and replacement fees associated with damaged possessions made of leather, vinyl, plastic and fabric. The new Creative Colors franchise will be owned by Joe Moorer, who has lived in Summerville for 30 years. Prior to joining CCI, he spent 17 years with two local companies in quality control, overseeing the standards and accuracy on a production process. He will continue to operate his own home inspection business in the Summerville area as well. Moorer is also a veteran of the United States Air Force Reserve. During his time with the Air Force Reserves, he was an Air Transportation Specialist, shipping cargo from one location to another. He spent six years in the infantry with the Army National Guard (1984-1990). Moorer then returned to the Air Force Reserve in 2001 with an air transportation unit and stayed until his retirement in 2015. According to Moorer, he’s thrilled to open this Creative Colors International location because the company’s revolutionary products and restoration techniques will help local customers save up to 90 percent in replacement fees by repairing worn and/or damaged materials. “Creative Colors is a well-known company with a very good reputation. Its mobile services make it much more convenient for the customer. The CCI brand stands out to me the most and it offers others a significant savings on any of their repair needs. Further, the statistics suggest that repairing and restoring, as opposed to upholstering and replacing, can save local business owners and residents hundreds of dollars on any damaged item. For example, the costs associated with upholstering any type of seat can be very steep, ranging anywhere from $120 to $450 per cushion. And according to Terri Sniegolski, Creative Colors International’s CEO, the commitment shared by all franchisees to help customers save money, and deliver on the company’s “We Can Fix That” philosophy, has been the key catalyst for the company’s expansion to 82 locations in 28 states with 160+ mobile units since its initial inception in 1980. Serving the automotive, commercial and furniture industries, Creative Colors International offers affordable solutions for tears, holes, scuffs, scratches and other damage found on leather, vinyl, plastic or fabric, through on-site repair, restoration, cleaning, dyeing and protection. 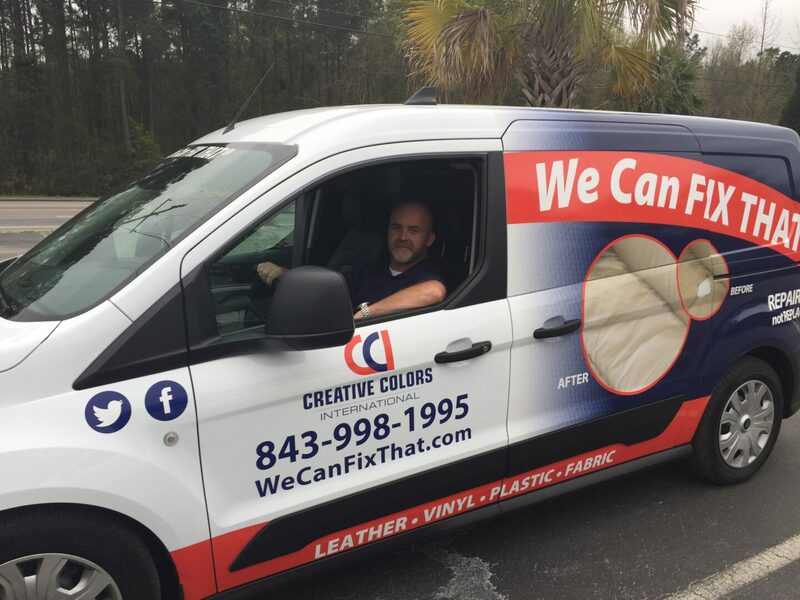 For local residents, this means Creative Colors International can repair auto interiors, leather furniture, RV flooring and boat vinyl, among other things. Additionally, for business owners, Creative Colors International can repair any upholstery found in critical locations around the company, such as waiting rooms, examination rooms, restaurant booths, hotel rooms and theater seating, among others. Launched in 1991, the Creative Colors International (CCI) franchise system was created through its affiliate, J&J’s Creative Colors, the original industry leader in refurbishment techniques and systems. Today, both companies continue to be family-owned and operated by the second generation. Catering to the abundance of upholstered items in every home, business and vehicle, CCI is the ultimate in on-site repair, restoration, cleaning, protection, and dyeing of leather, vinyl, plastic and fabric. Through proprietary technology, CCI restores damaged material at a fraction of replacement costs, saving customers up to 90 percent. CCI repairs are stronger than the original area and are nearly invisible to the naked eye. In the Automotive, Furniture, and Commercial Markets, CCI offers on-site repair and restoration to all types of leather, vinyl, fabric, plastic, and carpeting by repairing and re-dyeing holes, cuts, tears, burns, scrapes, fading, and discoloration. For more information on CCI’s services and franchise opportunities, visit www.wecanfixthat.com. The Ultimate Mobile Repair, Restoration, Protection & Dyeing of Leather, Vinyl, Plastic and Fabric! !